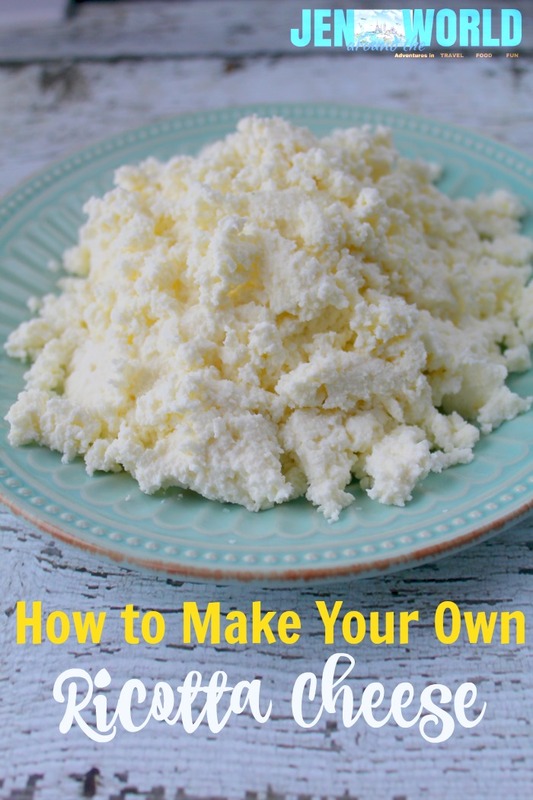 I am so excited to share this tutorial with you on how to make your own ricotta cheese. 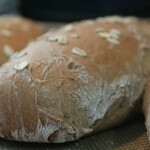 I love finding ways to create things from home that cuts the cost in the grocery store. This is SO simple and takes less than 30 minutes to make. Seriously — just 3 simple ingredients is all it takes to create this amazing pantry staple. 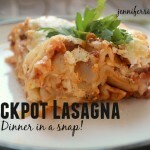 I use it in my crockpot lasagna recipe. I have also used it in my baked spaghetti recipe. You can also use ricotta as a topper for crackers. I recently saw where someone had wheat crackers, then topped them with ricotta, lemon zest, blueberries, and a drizzle of honey. It is the perfect pairing for any dish — whether you go savory or sweet. 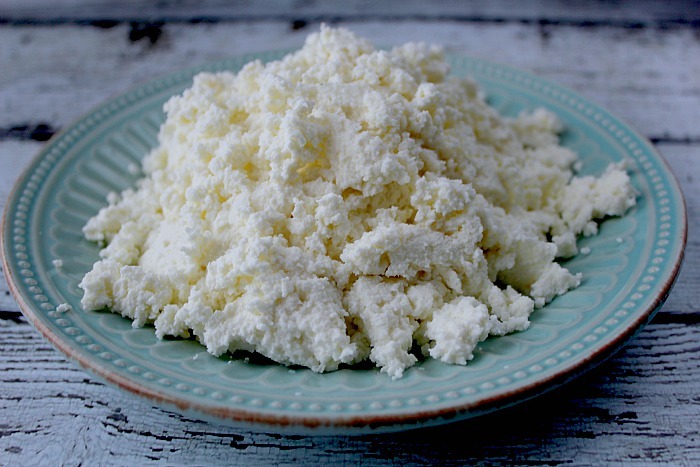 So here is how you can make your own ricotta right in the comfort of your own home. 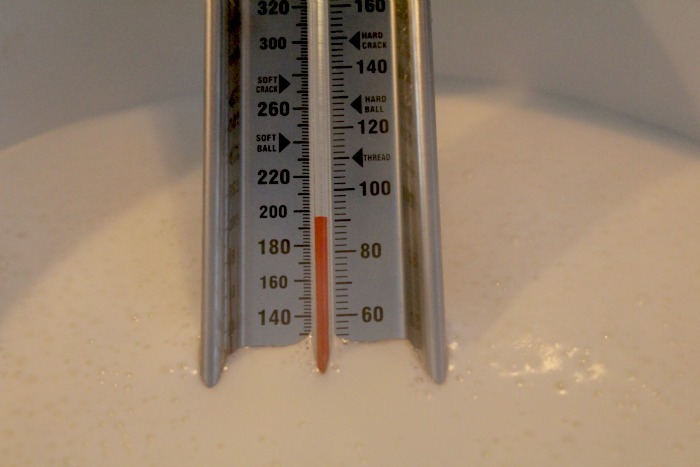 First — start with 1/2 gallon of red topped milk. Put it in a pot on the stove and pour in 1/3 cup of fresh squeezed lemon juice (about 2 lemons). Sprinkle in about a teaspoon of salt. Then, turn the heat on medium high and let it do the rest. You don’t have to really do anything but watch it. You want to bring it up to a slow heat — you don’t want it to boil. You want to get it right to about 200 degrees. Then once this happens, check your curds by swishing a spoon back and forth in the mixture. 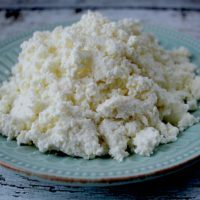 If it seems like there is not enough curds, simply add just a bit more lemon juice until it starts curdling — but I had plenty of curds after 1/3 cup. 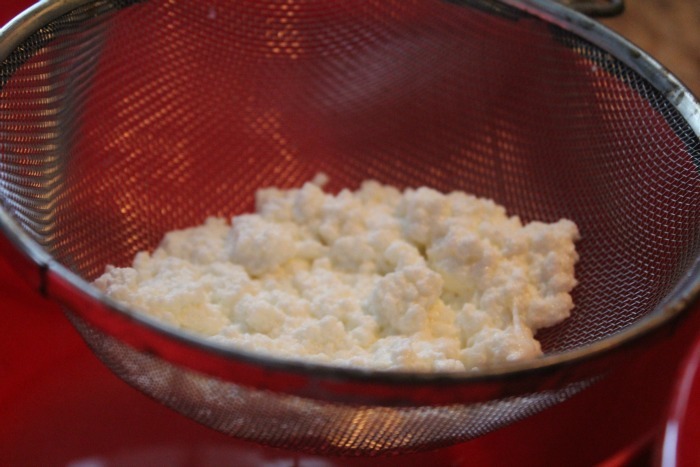 Then with a slotted spoon, you are going to transfer your curds to a strainer set over a bowl and let it strain. Now, every recipe I read said you had to use a cheese cloth, but Ina Garten from Food Network does not use one when she makes ricotta so I did not either. It is totally not needed. Once I got all of my ricotta in my strainer, I moved it around a little bit to release any liquids that pooled while I transferred it. Then I took my spoon and pushed some more of the liquid out. Then I placed it in the refrigerator for an hour to let it finish draining. I was so excited because I love ricotta cheese, but have you seen how much it costs at the store? Holy moly! It can get expensive. But now, for the price of a half of gallon a milk and 2 lemons I can make my own! 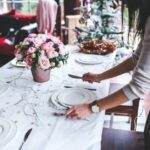 Here is the printable recipe for you! Let me know if you decide to make this. I would love to hear your thoughts. In a pot, put the whole gallon of milk in. Squeeze in the lemon juice and add 1 tsp of kosher salt. Mix together. Turn the heat to medium high and leave it along. Just make sure it does not boil. Bring it to a slow heat of 200 degrees. 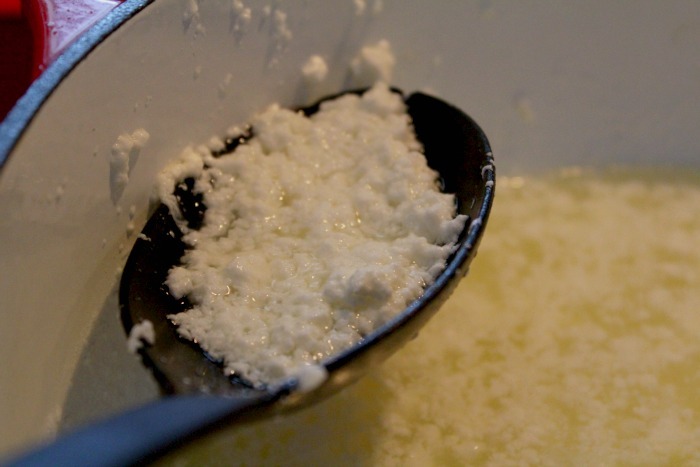 Once it reaches 200 degrees, move it around with a slotted spoon and transfer the curds to a strainer set over a bowl. Place in a refrigerator for an hour and then remove and enjoy. 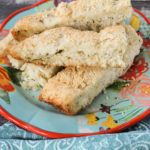 Sprinkle with pepper and enjoy on crackers or use in your favorite Italian dishes. What is your favorite homemade convenience food? Oh yum! I am from a big Italian family and we go through A LOT of ricotta. I need to try this. 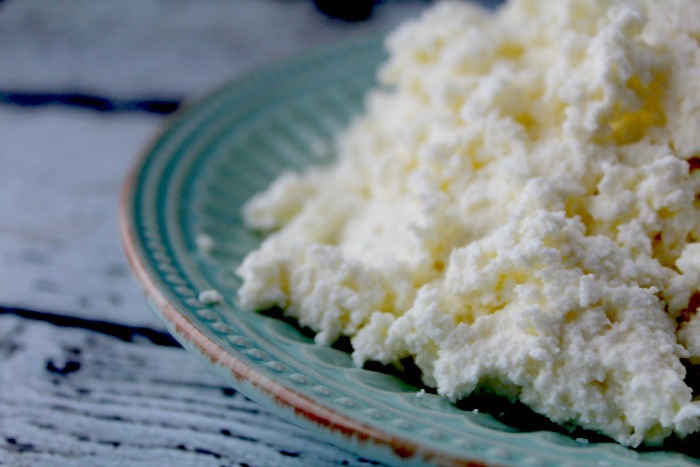 Wow, I never thought that you can make your own ricotta cheese. I will have to try this! YUM. I love this! 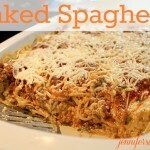 I’m glad I saw this recipe because we plan to make lasagna for dinner someday this week. This can save us a lot of money too. Ricotta Cheese is so expensive. I love ricotta, especially as a pizza topping and in traditional Italian dishes like lasagna. I had no idea making it at home was an option! Your ricotta cheese looks delicious. 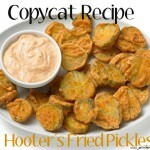 I bet like anything else, homemade tastes a lot better than store bought and it’s much more economical too. Yum, love cheese! This actually looks and sounds really easy to make. I’ll have to give it a try soon.